The Brompton H6L Folding Bike features Brompton's H type handlebar; ideal for the rider that likes to sit in a more upright riding position. With 6 gears Brompton’s Wide Range hub gear - which is made exclusively for Brompton by Sturmey Archer - is the most practical option on offer from Brompton, making it one of the best folding bikes out there. By having 6 gears at your beck and call, you can travel greater distances on your commute or weekend adventure without worrying about running out of gears. 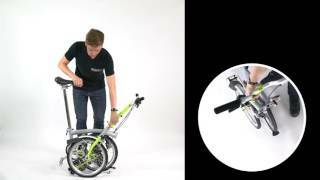 Brompton foldaway bikes are as simple and user friendly as they come, using their patented folding mechanism, no folding bike can fold as fast and as compact as a Brompton can. The H6L comes equip with Brompton mudguards, giving you the opportunity to ride to work in most conditions without having to worry about a change of clothes. Why buy from Evans Cycles? Buy a bike from us and get the following included. Free 6-week service - All bikes bought from Evans Cycles can have a free 6-week service with one of our professional mechanics. Ideal for making sure everything is working as expected. Right Bike Guarantee - Not 100% happy with your new ride? We offer 30-day exchange on any bike, even if you’ve ridden it. No questions asked. Free RIDE IT entry - With any bike purchase we provide a complimentary pass to any of our RIDE IT events located across the country.